'All About Presentations' by Jazz Factory: (Free E-book) How should your startup pitch to investors? (Free E-book) How should your startup pitch to investors? What are the hurdles in your way of securing funding? How do investors evaluate your pitch? How to create content for your pitch? How to design professional slides? How to deliver your pitch with confidence? 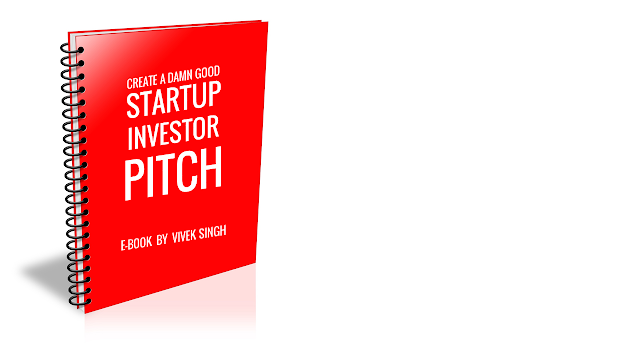 This e-book is a step by step guide to create, design and deliver a compelling investor pitch. It is the outcome of my 2 years of working with numerous startups, mentoring them, evaluating and fine tuning their pitches, attending demo days and interviewing investors. This e-book is also based on what I have learnt from awesome articles by other startup mentors, entrepreneurs and investors. To receive your free copy, send me an email: vivek @ jazz factory dot in or leave your email ID in the comment below. I will email the e-book to you. If you know a friend who is running a startup, share this post with them too. without having seen it, I´m sure it is a great job that not only entrepreneurs and "startupers" will thank you. I help as well in preparing pitches for startups in Spain, and I´m sure your book will me a lot. So, thanks a lot from a grateful collegue! Thanks for sending me information about your ebook. I would like to receive a copy of it! Hi Vivek, Will be great if you can send a copy at pushkar@vetcart.com .Thanks!